There exists the widespread idea of which the contemporary this architecture tied inevitably to the urban thing and therefore to the density of the great city. Nevertheless in territories or companies of life intimately tied to the field, the landscape or definitively the nature, the modern architecture has made way for itself in the rural environment. The rules are different, of major adjustment, of major precision, but the result of implanting contemporary architectures in places that seemed to be suspended in the time wakes a great interest up. The projects proposed in this type of environments, follow of systematic form a peculiar methodology, a method that chases the balance between a few buildings of marked ultramodern character but that at the same time there adopt the determining ones of the soil in which they agree. Thus the contemporary architecture proposes a luck of continuity with the place, with his landscape or even with his construction. 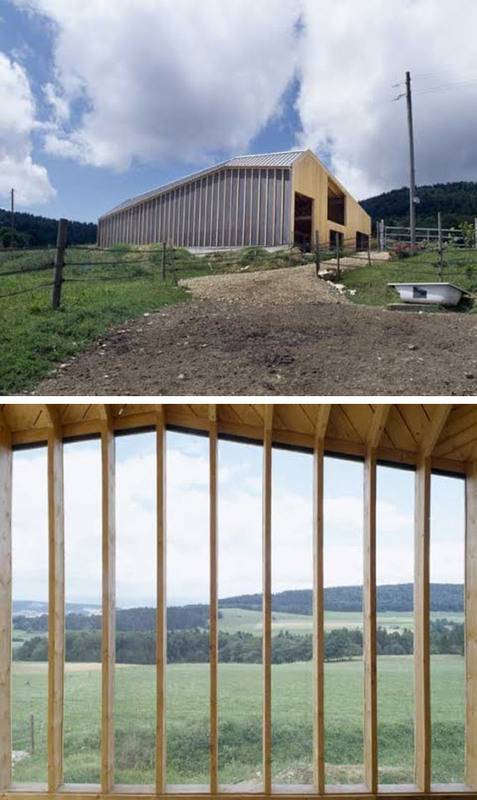 Maybe the work of the Swiss architects is better the one that has exemplified this way of approaching the rural landscape from the optics of the forefront. During more than one decade several generations of architects of the country of the Alps have had to work these models of balance between the tradition and the current thing. It is necessary to bear in mind the value of the rural environment and of the landscape that this European’s region grants to his territory, key from the environmental point of view but also from the vision of the tourist economy of the country. One of the maximum exponents of the Swiss architecture, the prize Pritzker Peter Zumthor, constructed in 1988 San Benedicto’s chapel in Sumvitg in an Alpine valley of the Swiss Grisones. The abbot and the monks of Disentis’s monastery decided that the construction had to be contemporary, like legacy for the future generations, and as a sample of the temporary continuity of the constructions. If the monastery had been extending according to the style of the epoch, medieval, Renaissance and then baroque, the current construction had to correspond to the architectural forefront. The structure amble of the building, the structure of the cover, end of the soil and even the interior furniture, as well as the door of access they are a lesson of construction in wood. 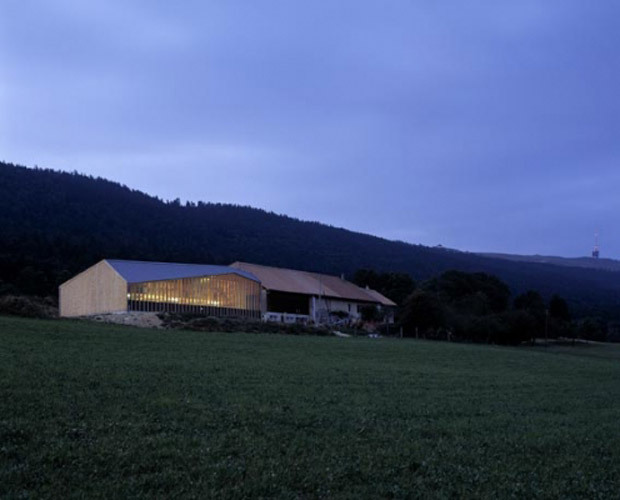 With the contemporary language of the laminated wood, but treated technologically with the traditional local technologies, Zumthor returns to do honor to the identity and to the local philosophy. All the knots are solved with assemble traditional, box and spike, taking advantage of the exquisiteness of this system of fixation to reinforce the clean language of his contemporary offer. By means of this materiality there is constructed an interior space sensitive to the context and calmed, without stridencies, adapted to the religious function for the one that has been projected and adapted also to the theoretical thought of his author. 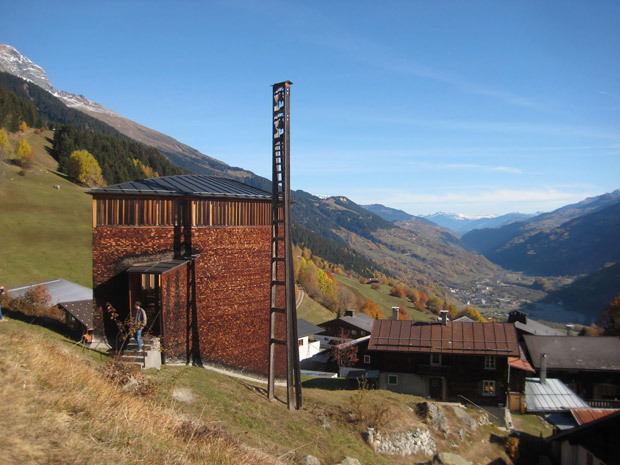 The material condition of this building, and of others realized by Peter Zumthor, grants to the matter determining that overcome the normative limits, of technical or enclosed behavior the aesthetic values, to aspire to understand them as cultural values of the context in which they are going to be secondhand. 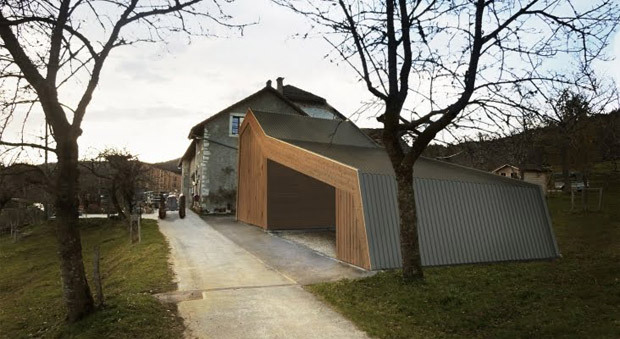 The exterior covering of tejuelas of larch, it is undoubtedly the most showy element of the building proposed by the Swiss architect. The construction of the front is again a rereading of vernacular, the drafty contemporary front is solved as the covers of the traditional houses of the region, which can turn in addition from the access to the church, establishing a direct relation with the local construction. 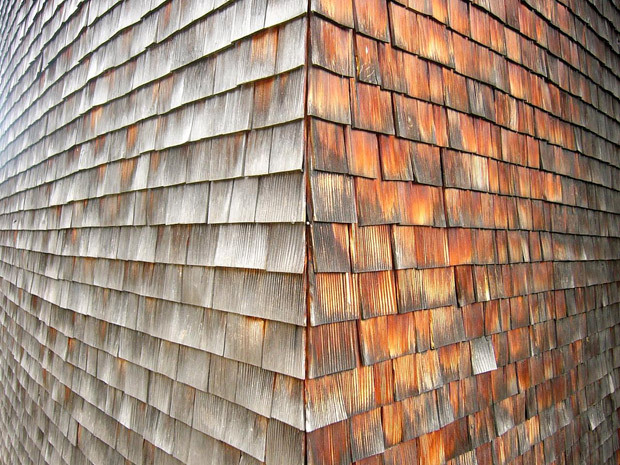 His materialization refers to the traditional Swiss construction of covers based on scales of wood, where the traditional thing and the contemporary thing touch each other once again taking the construction and the utilization of the material to the social and cultural thing. Dos generaciones después el joven estudio Local Architecture, sigue planteando una arquitectura que como su propio nombre indica pretende ser del lugar y además contemporánea. Dos de sus pequeños proyectos son fácilmente trasladables incluso a nuestro propio entorno rural. Un establo para 30 vacas en o un pabellón para el aparcamiento de un tractor. El primero adopta la geometría clara y rotunda de los pabellones agrarios de montaña, para con materiales del lugar como la madera y otros contemporáneos como el policarbonato ofrecer un volumen limpio y luminoso en total sintonía con el lugar. 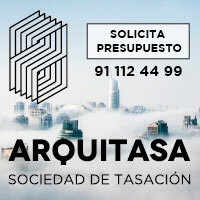 El segundo un pequeño pabellón para las labores de mantenimiento y almacenaje de todo lo relacionado con el tractor y sus accesorios mecánicos, se presenta en continuidad con el edificio de la granja donde viven sus propietarios. El nuevo añadido juega de nuevo con estas reglas entre lo tradicional y lo moderno, resolviendo su materialidad con zinc y madera laminada, claramente actuales y su forma mediante la similitud a otros elementos añadidos o superpuestos tan característicos de la actividad agrícola. So false as that the contemporary architecture is urbanita it is the idea of that in the rural thing must follow the traditional styles, in a luck of imitation without scruples that naif leads to. These examples like that demonstrate it, and are clearly applicable in the rural peoples of our near environment. The architecture of forefront has his space in the rural thing, a rural world that if it wants to live in contemporary has to accept also the benefits that it her can obtain of the new architectural expositions.